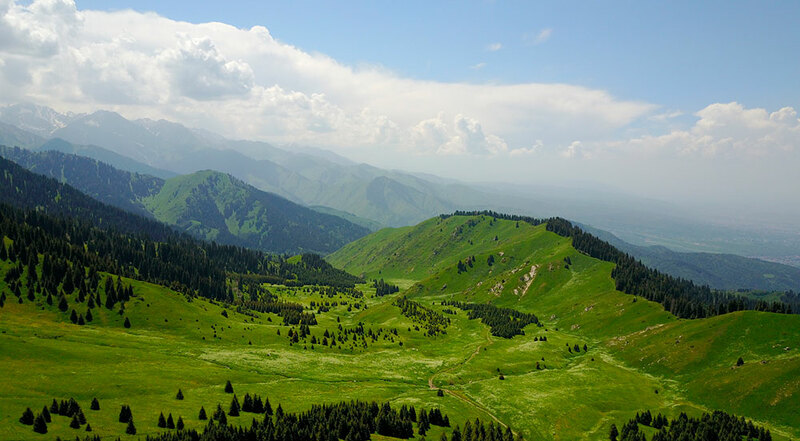 In this article, I will tell you about popular one-day walking tours in the mountains near Almaty, known as Zailiysky Alatau. 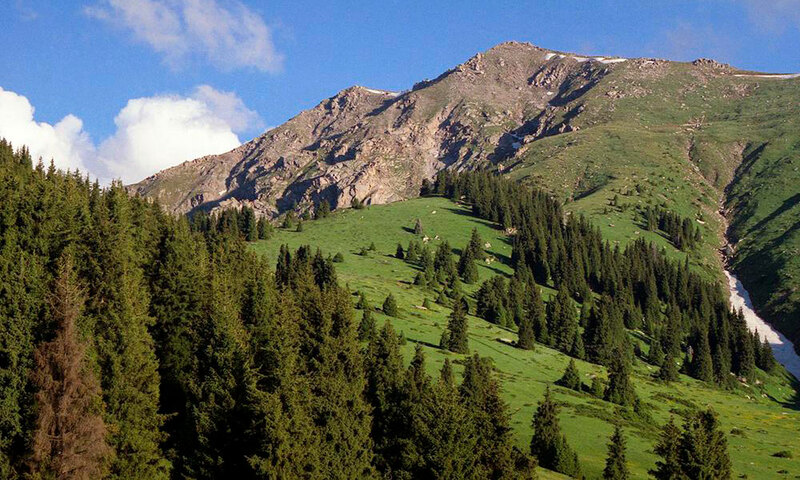 The season of treks to the Almaty Mountains lasts from May to October. You can get to the starting points of routes from Almaty by buses №12 and №28, the final №12 bus stop is located in front of the hotel "Kazakhstan", along Dostyk Avenue, and bus number №28 at the intersection of Al-Farabi and Dulati avenues, the bus stop First President's Park . Fare, as of the date of publication, by unified transport card "Onay" or by SMS 80 KZT, cash to the driver 150 KZT. All attached routes in kmz format. They work with the programs "Google Earth" and "MapsMe". The first route begins near the high-mountain skating rink "Medeo". To begin, you need to take a taxi or a bus №12 up the street Gornaya, before reaching 200 meters to the rink you need to turn to the left, right after the cafe Medeo Mountain Cafe. A couple of kilometers after the turn to the left will be the hunter's house, near which the asphalt road ends, if you were traveling by car, then the hiking part of your route begins. At a distance of 700 meters from the hunter's house, the trail will begin to branch, you can walk on any of trail, usually tourists prefer to follow the right path that runs along the Kimasar River. Link to the route in the KMZ format to the Kimasar Gorge. 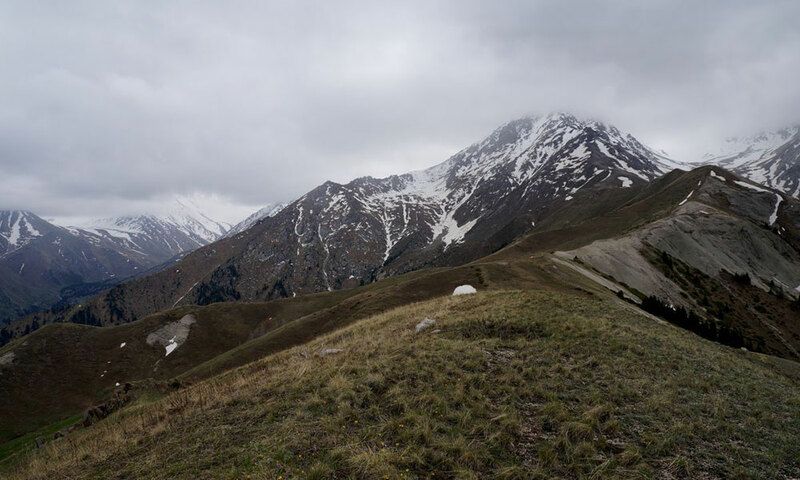 In a couple of kilometers after the fork, there will be an exit to the crest along which it is possible to continue the way and climb to the tops of Furmanov and Panorama, the ascent along the ridge to the specified peaks will take about 5 to 6 hours. 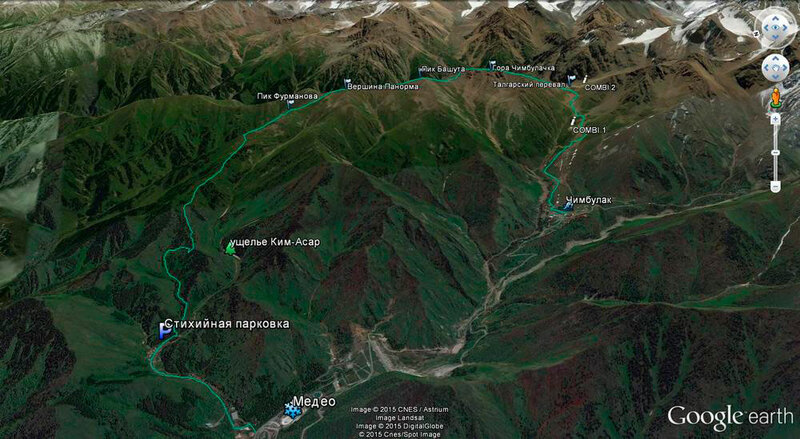 Link to the route in the KMZ format to the Mount Furmanov. If you do not climb the crest and move along the main valley along the river, then you will come out onto the waterfall. After the waterfall, you can climb the slope and turn to the right, where there will be a descent to Lenin's hut. Link to the route in the KMZ format to the Lenin's hut. The route starts from the bus stop of the №12 bus "Recreation House Prosveshchenets" (dom otdykha Prosveshchenets), the first kilometer of the route runs along the asphalt road, after crossing the river a good trail starts, which leads to the Kok Zhailau plateau. The total length of the route, before the start of the plateau is about 4 kilometers. Route in the KMZ format to Kok Zhailau. After reaching the plateau, you can climb the three brothers mountain, which can be seen from the plateau - it is a mountain with three large rocks that exceed the height of a person. The starting point of the route is a stream that flows down from Kok Zhailau. From the stream, it is necessary to move to the south along a good path about two kilometers to the mountain. The crest of the mountain in the eastern direction leads to the summit of Kumbel. Route in the KMZ format to Mount Three brothers. Ascent to the summit of Kumbel is recommended to people of good physical shape, not for the first time in the mountains. The crest to the peak of Kumbel is relatively gentle, with small ups. The summit of Kumbel is a rocky area with a magnificent view of the city and the peaks of the Maloalmatinsky spur. Route in the KMZ format to Kumbel peak. The route starts in the Great Almaty gorge (Bol'shoe Almatinskoe), which can be reached by bus number 28, you will need to get off at the final bus stop "GES-2" (hydroelectric station-2) or "Kokshoki village". First, you will need to climb the stairs along the pipe, which is located to the east of the bus stop. Near the end of the pipe begins a mountain serpentine, which is called the "Japanese road" this road in the 30-40's built Japanese prisoners of war. The prisoners punched in the mountains galleries for the city water supply and erected cascades of Almaty state district power station. The Japanese appeared in Almaty and other cities of Kazakhstan, after the end of the Second World War. 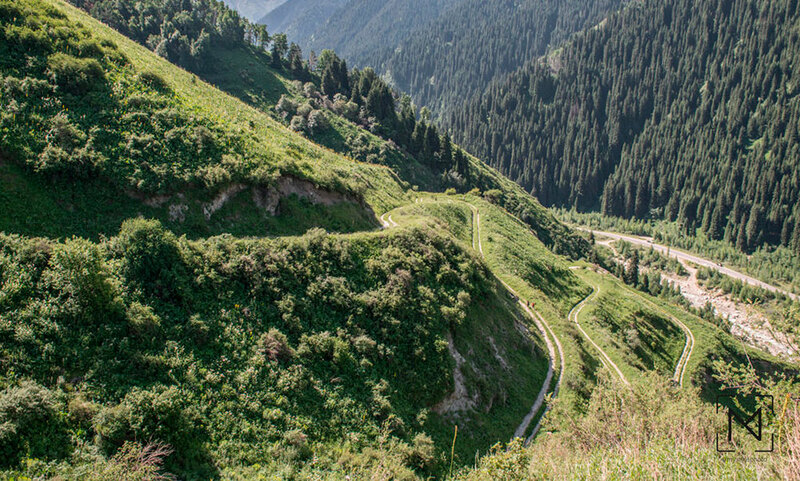 The way along the "Japanese road" is a tireless, pleasant walk along the East and Southeast slope of the mountain of the Great Almaty gorge with the subsequent descent into the gorge itself, from the road you can see the Great Almaty Peak (3,682 m.) and the mountain valley of the same name. Route in the KMZ format to "Japanese road". The way to the mountain Smotrovaya is also starting from the end of the pipe and runs along the ridge in an easterly direction up to a height of 2,360 m. After climbing the pipe, it is necessary to climb the crest that goes over the Japanese road and move along it in a southeast direction. On this way, you can see many peaks, such as Sovetov (4,317 m), Ozerny (4,131 m), Molodezhny (4,147 m), Bolshoy Almatinsky (3,682 m), Kargalinsky (3,675 m) etc. The distance from the bus stop to the mountain is 5.7 km, climbing over 1,000 meters. This is a circular route. The descent goes in the direction of Kok Zhailau valley, where the Kazachka and Tersbutak rivers merge. Then you descend along the river by road to the eco-post of the National Park. Return to the city by bus number 28. Route in the KMZ format to Mount Smotrovaya. 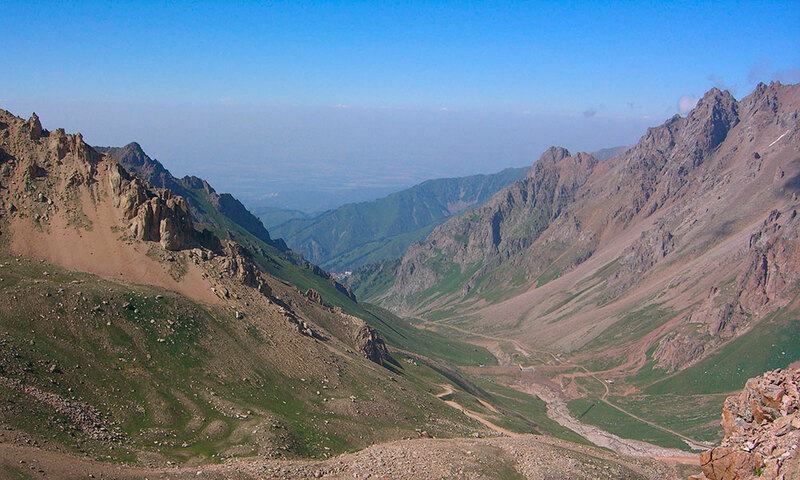 This route, like the previous one, begins in the Great Almaty Gorge. Near the final stop of the 28th bus, "HPP-2", the road branched, you need to move along the Prohodnoye gorge, this is the right road (the left road leads to the Big Almaty Lake) 1 km after the fork will turn right onto the dirt road to the Kaskabas Gorge. Further, we move up to the end of the gorge in the birch grove. Then traverse the slope along a not very good trail for 1.5 km in the northern direction (towards the city) to the Kokchak pass (2,170 m). From the Kokchak pass also to the north along the ridge to the visible mountain. On the grassy slope go a little over 1 km. The path here becomes hardly noticeable. At the top are visible spruce, it is the mountain Volchy (2,305 m). Route in the KMZ format to Mount Volchy. By trail, the view opens on the mountain valleys of the Prohodnoye and Kargalinsky gorges. 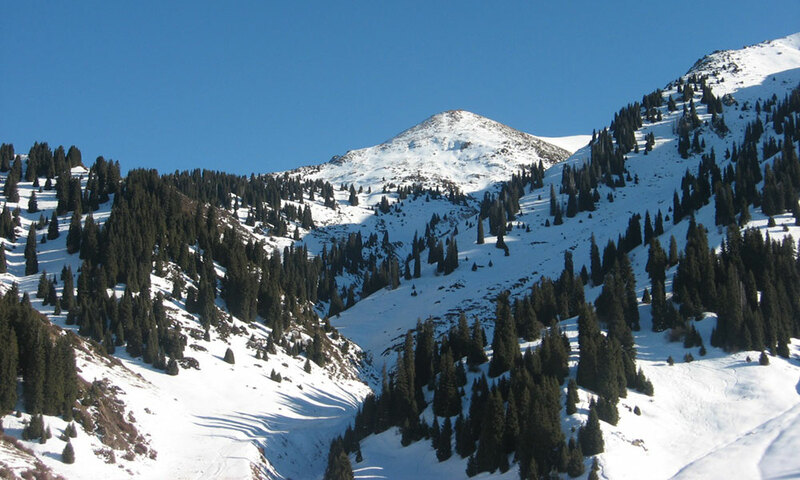 The view on the Great Almaty peak is very good. After rest, you descend the mountain range in a northeasterly direction. In the beginning, there is no path. It appears in the next coniferous forest. This route leads to the falcon nursery "Sunkar" below the eco-post of the national park. Return the city on 28 bus. The descent from Mountain Volchye is 4 km. Route circular, year-round; in the Gorge Kaskabas the danger of avalanches is present in March. This route starts from the ski resort of Shymbulak, at an altitude of 2,270 m. You can get there by eco-bus or cable car from the high-mountain skating rink "Medeo", to "Medeo" you can get on the 12th bus. The trip cost as of the date of writing the article by cable car 2,500 KZT, on eco-bus 600 KZT in both directions. Further from the resort of Shymbulak, we follow the good path in a southerly direction, along the Malaya Almatinka River. Along the road, you will pass the alpine camp Tuyuk-Su, the Alpinist memorial, the large rocky clamp "Tuyuk-Su Gate" and go to the Mynzhylki Dam at an altitude of 3,000 m. It offers good views of the mountain peaks of the Northern Tien Shan. From the dam, you can climb higher up to the moraine lake №6, glaciological station Tuyuk-Su, glacier and many mountain peaks. You can get down on the way up. Route in the KMZ format to dam Mynzhylki. In conclusion, I would like to note that in addition to these routes, there are many others both in the immediate vicinity of the city of Almaty, and at some distance. I did not detail each route separately, and describe the necessary equipment and so on, so as not to inflate the publication. I think if necessary, you will find detailed information about the route you are interested in on the Internet. Put "like" if the article was useful or interesting.